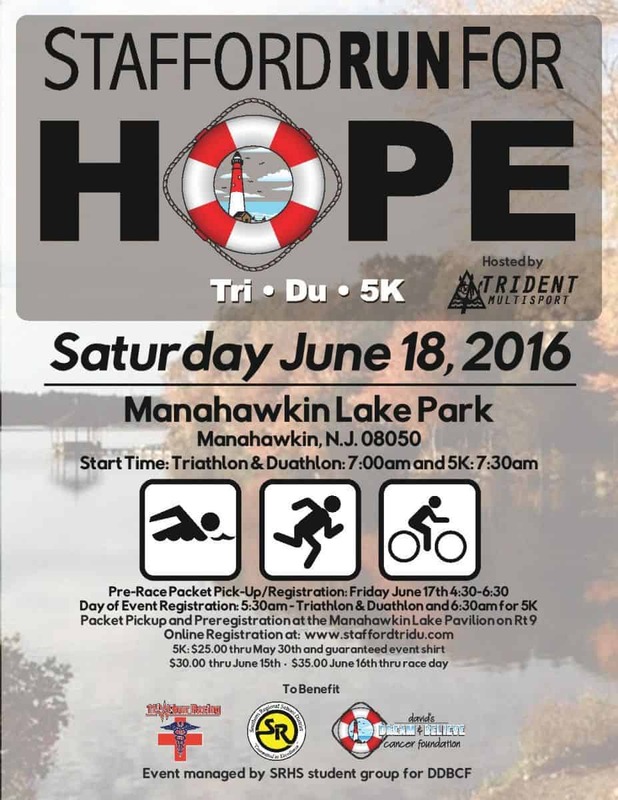 The 5th Annual Stafford Run for HOPE: Tri/Du/Aqua/5K will take place on Saturday June 18th at Manahawkin Lake Park in Manahawkin, NJ! This is the 5th year for the Stafford Tri/Du/Aqua event but this is the first year that David’s Dream & Believe Cancer Foundation will be integrally involved in this event in collaboration with our friend Ross Reynolds from Trident Multipsort! 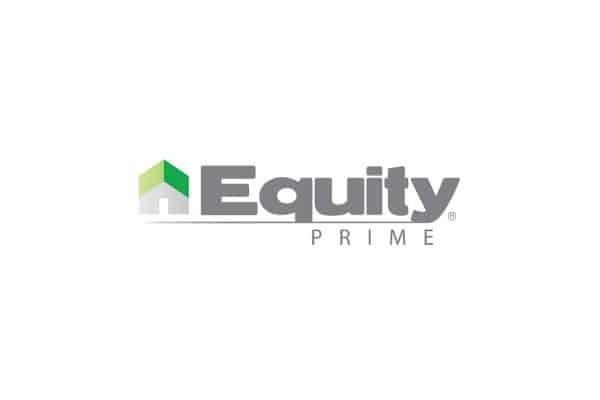 We want to thank our friends at Equity Prime Mortgage for signing on as our Presenting Sponsor. We cannot thank the team at Equity enough for their continued dedication and commitment to better serve our families affected by a cancer diagnosis! We are very excited that our David’s Dream & Believe student group from Southern Regional High School will be managing various aspects of this event for us and will have many students participating in the race. Our youth group Generation Dream will have many members and their families participating in this event. We are also excited to announce a new partnership with 11th Hour Racing. This organization created by Mike Rowe who is an ED/Trauma Tech in the ER at Thomas Jefferson University Hospital in Philadelphia where our Co-Founder David Caldarella was treated for Stage IV Head and Neck cancer. 11th Hour Racing’s mission is very similar to that of David’s Dream & Believe Cancer Foundation and Mike and David have created a friendship and partnership that will benefit our mutual families battling a cancer diagnosis! 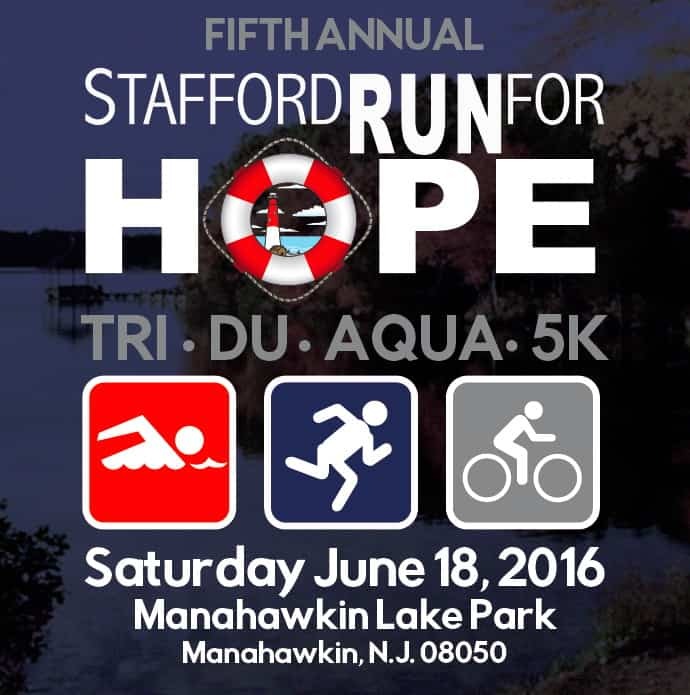 We are still accepting sponsorships for the 5th Annual Stafford Run for Hope: Tri/Du/Aqua/5K! Click on Sponsorship Form link below. 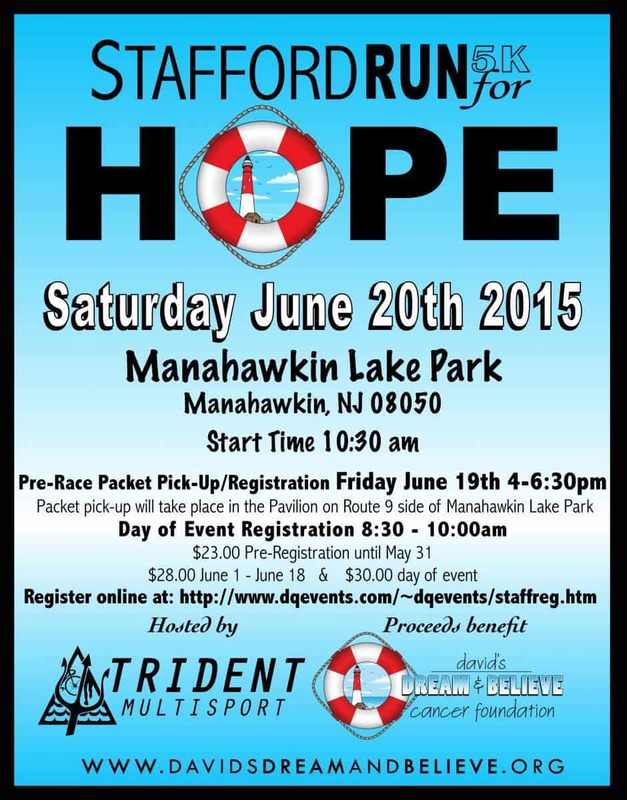 Please join us on Saturday June 20th for the Inaugural Stafford Run for Hope 5K presented by Trident Multisport to benefit David’s Dream & Believe Cancer Foundation! 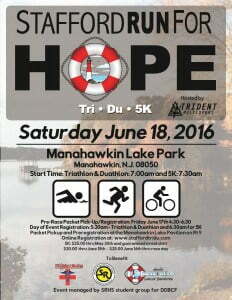 Pre-Race Packet Pick-Up/Registration: Friday June 19th 4-6:30pm. 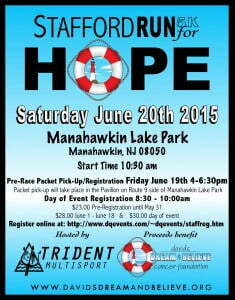 Packet Pick-up will take place in the Pavilion Route 9 side of Manahawkin Lake Park. We had an amazing inaugural campaign with our youth service group Generation Dream. 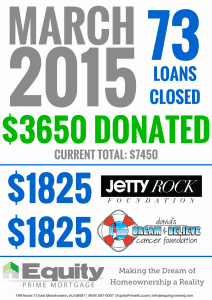 Our Dream Team raised a whopping $7, 689.32 for local families affected by a cancer diagnosis. They put the finishing touches on an incredible 2014 by hosting a Holiday Party for the oncology patients at our local Hospital Southern Ocean Medical Center. They’re excited to kick-off our 2015 event calendar with the Generation Dream Pancake Breakfast on Sunday March 15th from 8:30 – 10:30 at TGI Fridays in Manahawkin. Generation Dream will be assisting the Fridays’ Staff throughout the morning with various jobs including: Hostess, Food Prep and Servers. Admission is $10.00 and includes pancakes, bacon, sausage, coffee and soft drinks. 60% of the proceeds go directly to: David’s Dream & Believe Cancer Foundation! Our friends at TGI Fridays in Manahawkin, NJ have been proud supporters of the Foundation since 2011. We are forever grateful for our business partnerships in the community and TGI Fridays in Manahawkin remains a driving force behind the scenes for DDBCF. Please come out and enjoy breakfast with the Dreamers as they raise funds for local families affected by cancer! We were approached by some members of the Beach Haven Moose Riders last night while we were putting the finishing touches on an absolutely beautiful and amazing 2nd Annual Rocktoberfest! The sentiment was the same and it was one of shared disappointment with the final $ total. Our friends at the Beach Haven Moose Riders have set extremely lofty goals for themselves and their partnership with David’s Dream & Believe Cancer Foundation. Their lofty goals can only be matched by their enormous hearts! We informed our friends rather quickly that they’re making a HUGE impact in the lives of our families battling a cancer diagnosis! A tank of gas to and from the doctors/treatments can be a heavy burden for a family battling cancer! Rocktoberfest presented by our friends at the Beach Haven Moose Riders to benefit David’s Dream & Believe Cancer Foundation raised approx. $9,000.00 yesterday, which will not only provide gas cards for our families battling cancer but also: medical bill assistance, rent/mortgage assistance, utilities assistance, grocery gift cards & incidentals. The physical and emotional toll on the cancer patient and their caregivers are relentless. However, it becomes even worse when you consider the financial burden of a cancer diagnosis. A recent study in the Journal of Oncology Practice titled: Impact of Financial Burden of Cancer on Survivors’ Quality of Life?, concluded Increased financial burden as a result of cancer care costs is the strongest independent predictor of poor quality of life among cancer survivors! It’s clear that financial strain has a very powerful impact on a cancer patient’s perception of well-being. David’s Dream & Believe is only able to support our families battling a cancer diagnosis because of events like this one! We could not be happier or more proud as an organization to partner with an amazing group of individuals dedicated to giving back to the community like our friends at the Beach Haven Moose Riders! We would also like to thank: Beach Haven Moose Lodge #175, The Dutchman’s Brauhaus, Shop Rite Manahawkin, Party Crashers, Wealth Management Group, The Wandering Gypsea, Fritz Electric, The 559, Wildcard and Generation Dream. Generation Dream is the youth sub-group of David’s Dream & Believe committed to supporting our families battling cancer and generating a ripple effect of kindness, hope & love! Last but certainly not least, thank you to our incredible supporters who attend our events and make the decision time and time again to donate your hard earned money to assist our families battling cancer. This is a gesture that never goes unrecognized in our eyes and we thank you from the bottom of our hearts! 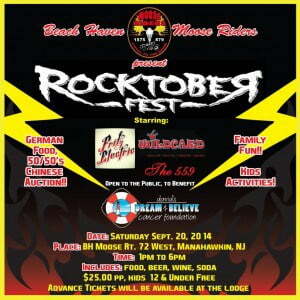 Please join us this Saturday September 20th at the Beach Haven NJ Moose Lodge 1575, 120 Rt. 72 East, Manahawkin NJ 08050 between 1-6pm for the 2nd Annual Rocktoberfest presented by Beach Haven Moose Riders to benefit David’s Dream & Believe Cancer Foundation with special guests: Fritz Electric, Wildcard and The 559! $25.00 per person and kids 12 & under are free! There will be a bouncy house, video game trailer and face painters for the kids. Food, beer, wine, incredible auction items and LIVE Music! You can purchase tickets in advance at the Beach Haven Moose Lodge or purchase tickets day of event! Our youth group called Generation Dream will be at the party selling t-shirts. Please join us on Saturday for a fun-filled family event that benefits our local families battling a cancer diagnosis! Thank you to our friends with the Beach Haven Moose Riders for their continued support with Rocktoberfest and throughout the year! 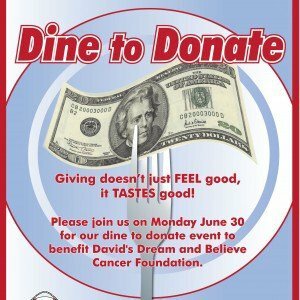 1st Annual Dine to Donate Monday June 30th! Our first ever community-wide Dine to Donate will take place on Monday June 30th! 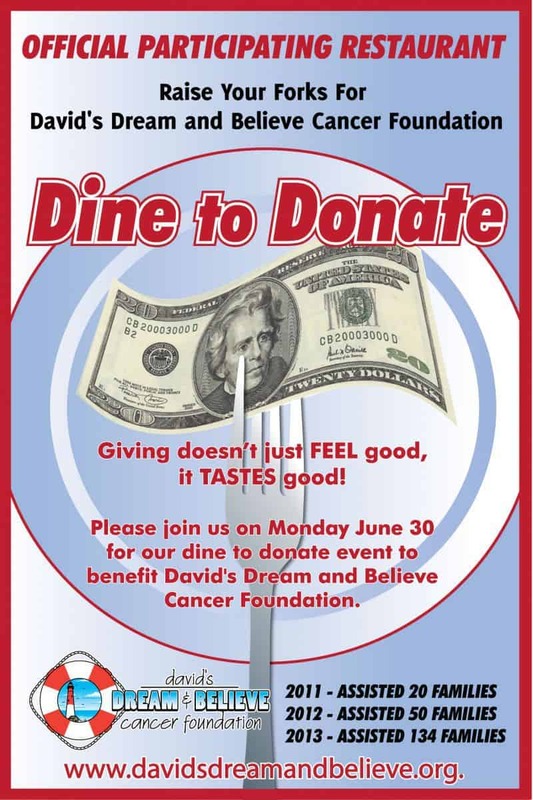 This particular Dine to Donate is a unique event that allows David’s Dream and Believe Cancer Foundation to ask community members to support the businesses that generously support the Foundation throughout the year while raising donations for our patients affected by a cancer diagnosis. Participating restaurants have committed to a flat donation or % of their register sales throughout the June 30th business day. Please use #dreamtodonate when visiting the participating restaurants and tag @davidsdreamandbelieve on Instagram and tag pictures to our Facebook page David’s Dream and Believe Cancer Foundation. Bagel Shack, Barry’s Do Me A Flavor, Bisque, Black-eyed Susan’s Café’, Bowker’s South Beach Grill, TGI Friday’s, The Gables, Howard’s Restaurant, Joe Pop’s Shore Bar & Restaurant, Joey’s Pizza & Pasta, LBI Pancake House, Lefty’s Tavern, Living on the Veg, Mud City Crab House, Panzone’s Pizza, Panzone’s Pizza & Pasta, Port Hole Cafe’, Sandbox Cafe’, Scojo’s Restaurant, Sea Shell Resort & Beach Club, Schwee Tea Co., Shore Fire Grille and Terrace Tavern. Bagel Shack Barnegat Barry's Do Me A Flavor Beach Haven Bisque Black-eyed Susan's Cafe' Bowker's South Beach Grill David's Dream and Believe Cancer Foundation Dine to Donate Harvey Cedars Howard's Restaurant Joe Pop's Shore Bar & Restaurant Joeys' Pizza & Pasta LBI LBI Pancake House Lefty's Tavern Living on the Veg Long Beach Island Manahawkin Mud City Crab House Panzone's Pizza Panzone's Pizza & Pasta Port Hole Cafe' Sandbox Cafe' Scojo's Restaurant Sea Shell Resort & Beach Club Ship Bottom Shore Fire Grille Surf City Terrace Tavern TGI Friday's The Gables The Schwee Tea Co. THANK YOU! 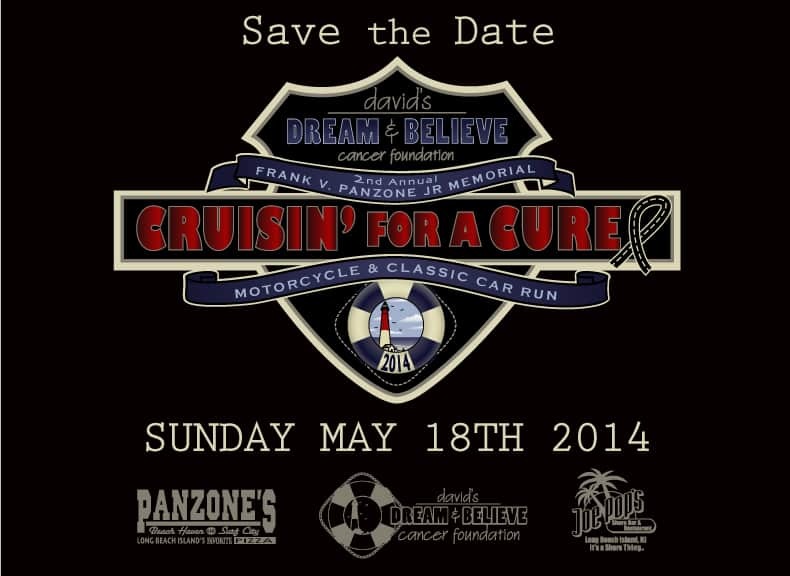 That is the major theme for this wrap-up of the 2nd Annual Frank V Panzone Jr. Memorial Cruisin for a Cure! Jillian Elsasser (Panzone) got the planning started for our 2nd Annual Frank V Panzone Jr. Memorial Cruisin for a Cure with an email after she had just left our Crabbin for a Cure event at Mud City Crab House on October 23rd. There were countless meetings, phone calls, emails and tireless efforts from so many for the better part of 7 months all to make sure our guests were going to have a good time at this year’s event but ultimately our goal is to always try to raise the highest amount of donations possible so we could support our patients/families battling a cancer diagnosis. The end result from those tireless efforts was a current donation total of $36,000+ and counting (doubling last year’s total) and a subsequent email was sent to SOMC this morning telling them we will be ready to start accepting new patient applications on June 1st. This is only made possible by the overwhelming generosity of our Committee Members, Guests, Cruisers, Sponsors, Auction Donors, Food Vendors, Musicians, Volunteers, owner Danielle Pessolano and staff from Joe Pop’s Shore Bar & Restaurant and our Main Event Sponsor Panzone’s Pizza and the Panzone Family! We must single out a few key people and we need to start with the Panzone family: Joyce Panzone, Kristin Panzone, Jillian Elsasser (Panzone), Jillian’s husband Todd Elsasser and Kristin’s boyfriend John. All of us at David’s Dream and Believe Cancer Foundation are honored to have Kristin and Jillian join the Board of Directors for the Foundation. We would not be able to pull off this amazing event without Kristin and Jillian’s efforts. We will just tell you that they’re both responsible for managing every aspect of this year’s event and Kristin is the creative genius behind our logo, fliers, signs, social media images and new to this year’s event our Cruisin Fashion Collection which will be up on our website in a day or two. They were the ones that purchased ALL the candy for the Panzone’s Cruisin Candy Drive for the past 6 months and anything else remotely attached to this event. A special thanks goes out to Catherine Deely for all of her efforts recruiting new sponsors, soliciting auction donors and setting up the auction at Joe Pop’s. Catherine has worked for the Panzone family since she was 14 and looked up to Frank as a second father her entire life. Her work on this event is a labor of love and tribute to the pay it forward mentality of her hero Frank Panzone! Finally, thank you to our namesake and HERO for this event Frank V Panzone Jr. For those that don’t know, we renamed our Cruisin for a Cure event the Frank V Panzone Jr. Memorial Cruisin for a Cure to honor and pay tribute to a man that spent his life giving to his community. We could go on and on about Chowderfest, Chamber of Commerce President but we like to think about that first Cruisin for a Cure when Frank rode his Harley in terrible weather conditions with his daughter Jillian on the back of his bike while undergoing chemotherapy and radiation treatments of his own. It was important for him to ride in the midst of his own pain to benefit others battling this deadly disease! Mother Theresa said, “I alone cannot change the world, but I can cast a stone across the waters to create many ripples.” Frank created a tidal wave and we are honored to pay tribute to him with this event that will continue to serve patients and families in dire need of our assistance. Thank you to everybody that took part in our 2nd Annual Frank V Panzone Jr. Memorial Cruisin for a Cure! See you next year! 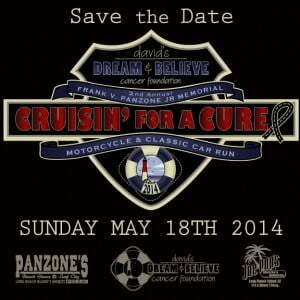 Please join us on Sunday May 18th for our 2nd Annual Frank V. Panzone Jr Memorial Cruisin for a Cure. This is the third year for Cruisin for a Cure but we renamed the event last year to honor Frank V. Panzone Jr. Frank was so giving to his community throughout his life and this was on full display even as he battled stage IV cancer. His spirit, determination and courage in the face of indomitable odds are only a couple of the reasons we are so proud to call this event the Frank V. Panzone Jr Memorial Cruisin for a Cure! You do not need to ride a bike or own a classic car to enjoy the party at Joe Pop’s from 12-5. Please see event flier for details. You can download our Auction Agreement, Registration and Sponsorship forms right here or from our main page. Please Like our Facebook page and Click on our event page for this event. Let’s Go Cruisin for a Cure!